In December 2014, the second test version of the satellite in the GLONASS-K (14F143) series reached orbit successfully, even though years behind schedule. The spacecraft received an official designation Kosmos-2502. Above: A Soyuz-2-1b rocket with GLONASS-K No. 12 lifts off shortly after midnight on Dec. 1, 2014. 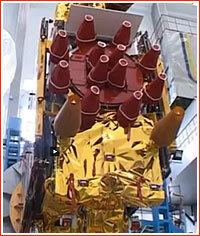 Representing the latest upgrade of the Russian GLONASS satellite navigation system, GLONASS-K No. 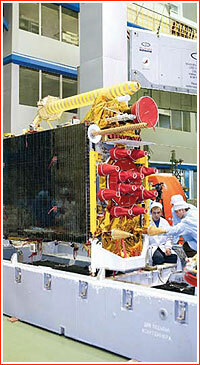 12 was the second spacecraft in the GLONASS-K series. Both satellites were intended primarily for flight tests, paving the way to the eventual replacement of operational GLONASS-M satellites with GLONASS-K birds. A Soyuz-2-1b/Fregat rocket lifted off from Pad No. 4 at Site 43 in Plesetsk as scheduled on Dec. 1, 2014, at 00:52:26 Moscow Time (4:52 p.m. EST on Nov. 30). Following a standard launch scenario for GLONASS missions, the Fregat upper stage performed three engine firings successfully delivering the satellite into its operational orbit around 19,100 kilometers above the Earth's surface. The separation of the satellite from the upper stage took place as scheduled at 04:25 Moscow Time on December 1 (8:25 p.m. EST on November 30), according to a Russian military spokesman quoted by the official Russian media. 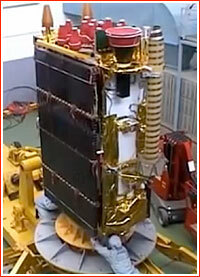 Within the GLONASS constellation, GLONASS-K No. 12 received designation No. 702. The spacecraft was intended for the Orbital Plane No. 2, Position No. 9 within the network. According to ISS Reshetnev officials, the satellite would undergo testing for a period of six months before joining the operational system. Originally, scheduled to go into orbit at the end of 2011, soon after the launch of the first satellite, the second GLONASS-K had to be postponed to address the problems found in a timing device onboard its predecessor, the official ITAR-TASS and Interfax news agencies reported. As of the second half of 2011, the launch of the second GLONASS-K satellite was promised in February 2012, as electrical tests of the spacecraft were completed at ISS Reshetnev. However by the end of the year, the head of ISS Reshetnev said that the mission was now expected in the middle of 2012. By March 2012, the launch was expected in the third quarter of 2012. By August 2012, the launch was scheduled for Nov. 14, 2012. 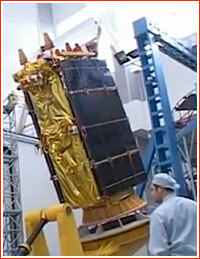 In the fall of 2012, ISS Reshetnev announced that the delivery of the satellite to Plesetsk was expected on Dec. 3, 2012, when the launch was scheduled for the end of December 2012, however by the end of November, reports surfaced that the launch would have to be postponed to 2013 due to problems with the Fregat upper stage discovered during tests in Plesetsk. 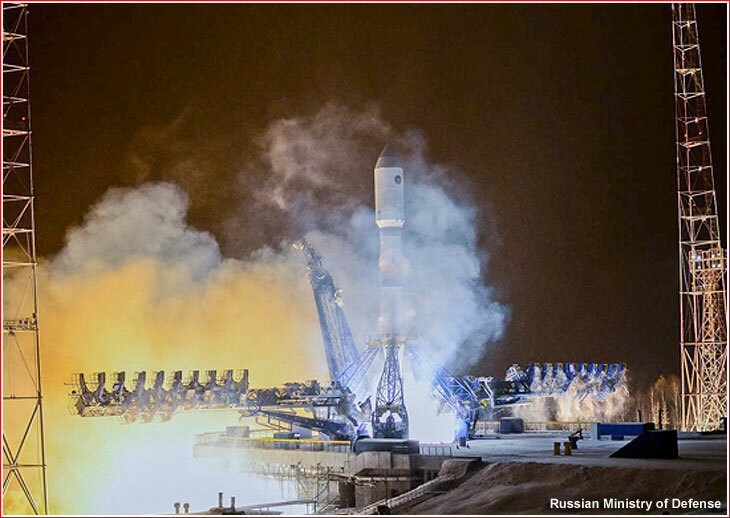 According to the Izvestiya daily, the propellant control cables onboard the stage were misplaced among other problems. A reliable industry source said that one the flight control modules with multiple failures in mechanical switches would be replaced. At the begging of 2013, the launch was scheduled for March 1, but within month, the mission reportedly disappeared for the flight manifest. Only by the August 2013, the spacecraft re-emerged now scheduled for October 2014! At the beginning of September, the Interfax reported that the launch was postponed at least until December 2. 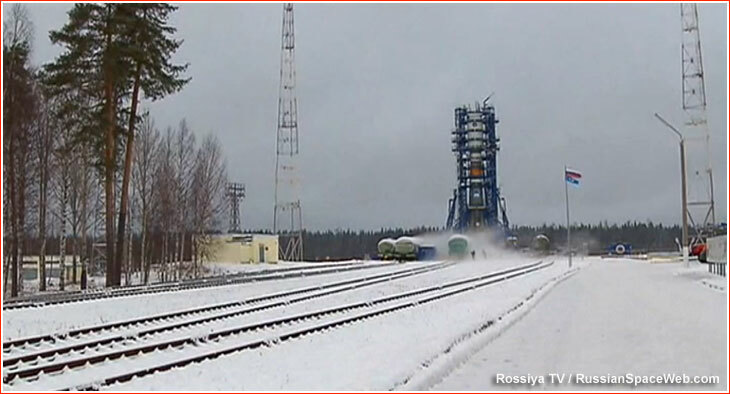 At the beginning of November 2014, ISS Reshetnev confirmed that the spacecraft had been delivered to the launch site. The payload section was integrated with the launch vehicle on November 27, 2014, and a day later the launch vehicle was rolled out to the launch pad. 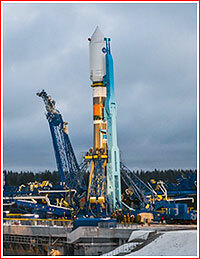 Above: A Soyuz-2-1b rocket with GLONASS-K No. 12 satellite on Nov. 30, 2014, few hours before launch.